← Lessy’s World Shows Us The Pasta! 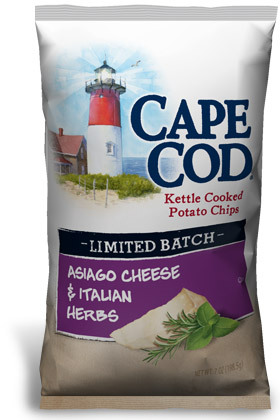 The awesomely good Asiago Cheese & Italian Herbs Potato Chips by Cape Cod! I admit it. I have a few problems when it comes to food. No, let us not say problems. I have opportunities that need attention. One of these opportunities I have is an addiction to potato chips. This love affair isn’t with just any old bag of chips either. Since the day one of these bags of Cape Cod Asiago Cheese & Italian Herbs made its way into the cupboard, it was love at first taste. “Oh my God!”, I thought, as the robust combination of flavors rushed my taste buds and held them hostage. I knew right then I was in trouble. What have I done? How am I going to tell my wife that I ate the whole bag in 45 minutes? I’m not! I tried to tell myself I didn’t have an issue with these chips. I could leave them alone at any time. I’ll try another brand and flavor and forget all about Asiago. “That mouth-watering taste had no hold on me”, I proclaimed. So I opened up the other bag of chips and begin to eat. I ate one and then two. Just when I was about to eat the third, I sealed the bag and threw it in the cupboard. My taste buds were rebelling to this unfamiliar taste I tried to force on them. A self-diagnosis revealed my potato chip addiction to Asiago. This had to stop. I couldn’t see those bags anymore. Fresh delicious cherries bring 11 benefits for your health. Click the picture for more information. When my wife and boys returned from the grocery store yesterday, I felt a little sadness. I knew I wouldn’t be able to reach up into the cupboards and embrace Asiago. Yesterday was a different feeling. I found myself reaching into the refrigerator last night to grab a handful of fresh delicious cherries. As I looked closer, I saw apples…lots of them. In the crisper below the apples are tangerines and grapes and plums! I used to eat these all the time as a kid. 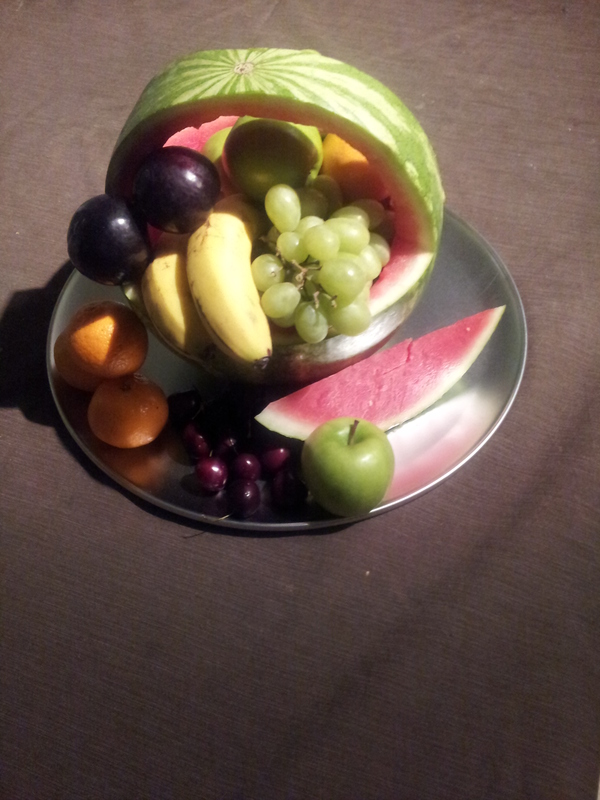 Grandma said that fruits were good for us. This abundance of fruit will be my potato chip addiction therapy. My potato chip addiction has changed some things in the house. But let me be clear. I can’t put everything on Asiago. I was becoming a junk food poster child. I would dip chocolate chip cookies in my coffee in lieu of dinner! My love affair with Asiago just made us aware of some poor eating choices that led to unhealthy eating habits. Poor eating choices that develop into habits eventually lead to other health concerns. I’m not saying that all junk food is bad. It just has to be consumed in moderation. Well, folks, I’m off to the cupboard…make that fridge, to grab myself a shiny green apple. I’m going to miss you Asiago but eating one of these apples a day will keep the doctor away. I carved this watermelon into a basket to hold my new found snacks. Posted on August 2, 2014, in Uncategorized and tagged apples, asiago, asiago cheese, asiago cheese italian herbs potato chips, asiago cheese potato chips, benefits of cherries, best apples, best oranges, cherries, diet, dieting, fresh bananas, fruit, fruit basket, fruit baskets, fruit diet, green apples, oranges, plums, potato chips, red apples, tangelos, tangerines. Bookmark the permalink. Leave a comment.